It would take a day or so to get a flight back to Oregon… In the meantime Aikiko saw a few more of the usual attractions – and did some indirect investigation of Toho studios! First up, the architect – who turned out to be one “Ariskari Mekan”, a noted Feng Shui expert. Supposedly an elderly mystic at the time, he was now supposedly well past a hundred and was rumored to be a taoist immortal. “He” (or a successor) still dropped by the studio on occasion to get a film made. He apparently brought his own – rather odd – scripts, although they almost always involved some weird martial arts. Fortunately, with some digging, there were some bootlegged transcripts available online. Hm… A futuristic sci-fi drama with some oddly political overtones that had been mostly distributed in Taiwan and India, a documentary on the Mystic Martial Arts of Tibet, and another on Creatures of the Vanishing Rain Forest featuring a brief martial arts battle with a vicious lizard-thing. There was even a privately-distributed one she could only get a few stills from. They showed some awfully high-end martial arts stances – apparently a training film. So… the older mechagodzilla was an alien weapon, built and run by remote control from a secret base under a mountain. The aliens looked human on the surface, but were stronger and faster than humans and were utterly strange underneath. They had taken refuge on earth from some alien disaster and wanted to own it. When they died they lost their human guises and then the bodies dissolved – sort of losing color than crumbling like plaster of paris. That sounded weirdly familiar from something beyond movies somehow. The newer one (well, one of them; some of the films were confusing) was human-built to fight other Kaiju – using the bones of the original Godzilla as a basis. It was basically haunted, was piloted by a crew of people (incredibly skilled and tough people, but still), often needed to recharge, was capable of short-duration flight – and could pull off fancy martial arts maneuvers. It was also the version with the super-freezing ray. Well, that matched fairly well with what happened in Oregon – her possible Lunar apparently did engage in a fist fight with it – and got taken out by a super-freeze ray. Well, any young exalt was vulnerable! Even with “perfect” defenses, if you ran out of motes you were in trouble – and there were plenty of weird – and even mundane! – effects that basic defenses didn’t over. Parry a landside? Not harmed, but still buried! Even if the guy DID use a perfect defense, he’d be trapped in a crystal or something. Hmm… It was possible this Mechagodzilla combined aspects of the two. If so, the base would be relatively nearby – and Oregon was pretty rugged… There’d been quite a few mountains not all that far from town… the presumed-lunar had been a climber… Maybe she should have looked at mountains before flying to Japan – but then she’d been wanting to see Japan anyway and it had worked out just fine! She’d just have to come back for the shoot! The casting, final scripting, and so on was expected to take another five weeks before things would really be getting started… That should be more than enough time! 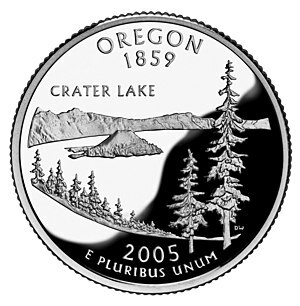 OK… The biggest mountains in Oregon were the Cascade Range – but they covered most of the state. It was on the Ring of Fire and was quite geologically active. Oh of course; Japan. The base would be in a volcano; if you wanted to draw on the power of a media image and it’s cult, you’d haul in every cliche you possibly could… At least that would help narrow things dow! So; what was the closest volcano to Roseburg Oregon? 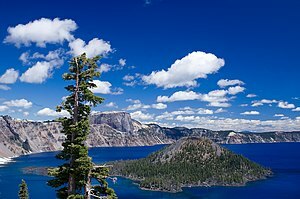 It looked like… The Three Sisters, then the Newberry Caldera, and then Crater Lake. Crater Lake was the most scenic by a good long ways. She went to have a look. It was neat, and who knew? More boring travel time later, Crater Lake was indeed impressive! It was beautiful, and deserved to be a park, and it was rich with dragon lines, and… wait. Several of them flowed in and around the mountain. She’d have expected quite a demesne – but her best efforts at tracing them showed them diving down deep and… petering out. Weird! A beautiful place, rich in essence, and it had been left undisturbed until the government had put up a road so people could come and look at it? Hard to believe! As hard to believe as all that essence just “vanishing” into the deep earth… Somebody should have claimed the spot a long time ago. Perhaps a hidden manse like that one that Charles had “raided” in Atlanta? The Park Rangers didn’t know anything about magic, even if they were chock full of facts about the lake and the local geology – and the swarming tourists were mostly seeing what they expected. From all appearances the area was so normal that it hurt! NO PLACE was that carefully ordinary unless someone was purposefully keeping it that way! Well, swimming was allowed! And she was no ordinary human and the Behemoth Cloak could easily let her operate underwater! The bottom was deep indeed – and there was a fairly subtle (and very complex) ward, over an area that shimmered to essence sight – and radiated siderally-aspected and wyld energies. Sidereal AND Wyld? More weird stuff! And the ward was far too complex for her to decipher too! Still, at least part of it was quietly influencing scientists – and fish – into staying away from that part of the lake bottom though. On the other hand, it apparently did nothing to stop pebbles since the one she tossed drifted gently down, tumbled through the ward, dropped through the bottom of the lake – and vanished. So at least part of it was covering up SOME sort of passageway! There was no point just hanging out around here! She swam deeper and tried to force her way through! Aikiko rather frantically tried to use the Behemoth Cloak to grow wings – and managed it a mere instant before she would have hit, braking most of the impact before she lept up again. Unfortunately, Aikiko utterly botched her attempt to figure out what it was saying, managing to turn it’s greeting into “Must devour more exaltations and obtain infinite power!”. That was a lot to get out of one vocalization, but maybe it was “big body small words!”? Of course, Aikiko had already half-meant to punch it – and was getting a little impatient to resolve things! Aikiko tried to make that out, since even she was not foolish enough to think that she had actually hurt it – and did much better this time. (Aikiko) “So… I guess you’re not eating Exalted. What were you doing at Roseburg, then? A hurried glance at the workers showed them to be… still mostly human looking and mostly still incredibly good looking – but with reddish skin, flame-colored or flaming hair, elaborate stylized Amerindian outfits, fanciful weapons, some with animalistic features, a few that seemed to just project emotions that she could feel by looking at them… Fey. What in Oblivion was going on? Got change for a Kaiju? Wait, “small worshiper”? Oh good grief! She had just watched all the Mechagodzilla movies! By Kaiju rules… that probably DID make her a worshiper! Arrgh! Weird! Those mountains seemed to be getting closer a lot faster than was at all reasonable! Well #$%&, it’s the Cauldron Born, isn’t it? After all, there’s only one being (as far as I know) that uses BOTH Sidereal and Wyld essence. Quite right – although, at this point (the logs are always a session or two behind) Aikiko was evidently a bit too preoccupied to put the pieces together.